Enlighten is my latest contribution to the PmWiki platform. Nothing too special here: a basic 2-column blog layout. But it was easy to produce, and helped me narrow the time it takes to do each part of a skin conversion. Turns out the basic conversion is pretty quick. A few hours. What adds the time is all the extras. Adding fixed/fluid width support; multi-color themes; support for BlogIt. All told, it seems to take around 20 hours to do a skin conversion. First of all, sorry for posting here but is the easiest way I've found for communicating with you. Any idea bout what's happening? Manel: Thanks for letting me know. I uploaded a new version of Skittlish that fixes this issue. If you have additional problems, feel free to post them on the Skittlish comment page. It works OK! Thank you very much for the updated version. Hey, is it possible to edit the credits? I would like to add a copyright notice for my website.edit the credits? I would like to add a copyright notice for my website. @codeMan: You could add a copyright notice to Comments.SiteFooter or Site.SiteFooter pages -- just edit the pages as a normal wiki page. Alternately you could edit the file skin.tmpl and add your copyright text in there. I tried to leave a comment on the Enlighten-Talk page (and the Users page) on PmWiki, but when I hit Save, nothing happens. Maybe I have to register or something. In any event, I want to thank you for the Enlighten skin for PmWiki. It's a great skin. We are using it for our web site at http://aikenseniornet.com. 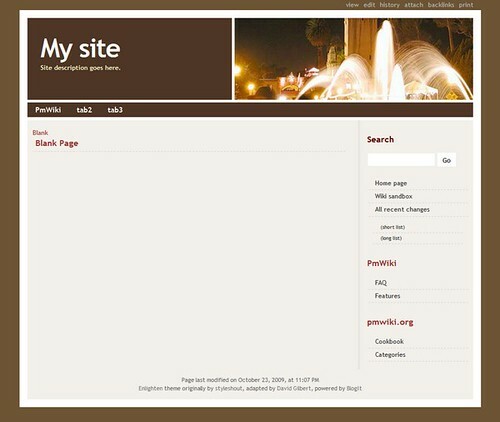 Odd -- you do not need to register to edit a page on PmWiki. The site has been slow recently, so perhaps that was the problem. Either way, glad you found the skin useful, and thanks for the comment.